So I decided that with all that extra green Berella yarn I would start a sampler afghan. This is my first square. I'm a little concerned that all the squares aren't going to be the same size so we'll see how this goes. I found the pattern for this square here. I modified the pattern just a little bit to be 9” x 9” so for my gauge I needed 41sts and 63 rows; I managed to tweek the pattern to be 41 and 65 rows. I eliminated two sts on the ends of each row (-4) so my cast on was 41. 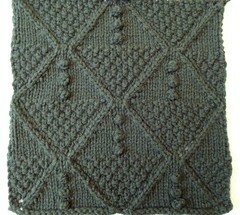 I also eliminatd the first 4 border rows and the ending border so after my cast on I worked rows 5-51 then knit rows 20-36. It’s still just a tad bigger than a 9”x9”, but I’m trying to block it smaller. It’ll probably stretch back out… oh well. Note: the pattern reads to cast on 47, but the chart is for 45 sts. This blocked well and despite being a tad large, I think it’ll work.